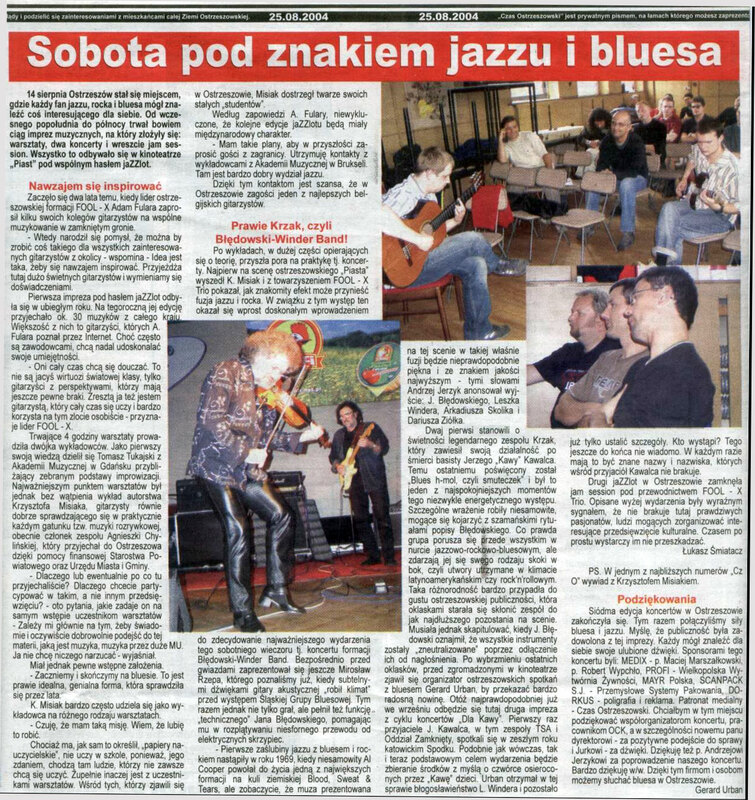 Adam's workshops in Gitarzysta magazine ("Guitar Player" - Polish ed.) has been published at the www site of the magazine. Liks are in the Workshops section. Only in Polish, although with tabs, scores and mp3s. Check it out. Over 2.000.000 visits has been noticed since 2002 (refreshing excluded). Thank you! Adam Fulara uses Taurus effects, more details in the gear section. 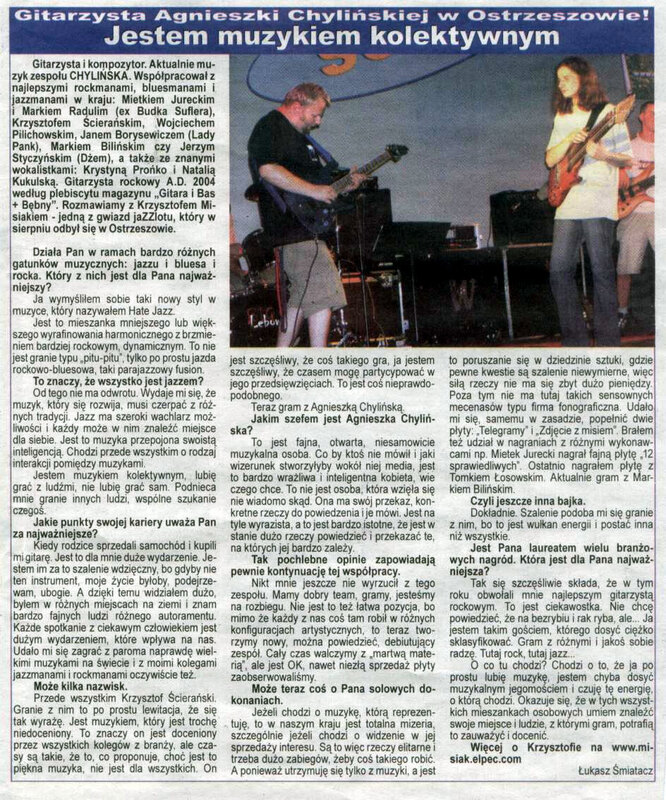 Check out the photos from Fool-X trio gig in Ostrzeszow (PL) at the Music Happening 2010 Festival. Oct 12, 2010 - Tom Fulara in "Bass Player"
Tom Fulara has started bass workshop in Polish ed. of Bass Player Magazine (Magazyn Basista). Check out the photos from Muzyczna Mlodziez 2010 Festival. Fabian Urbaniak is the new Polish tapper in the directory. New recording has been written by Adam Fulara to celebrate 750 years of his hometown OstrzeszĂłw. This is also the Guitar Idol entry. You can see it and vote here. Check out new photos from bass gig in LO 14 (Wroclaw). New movie on YouTube is experimental counterpoint improvisation on Eminem's "Lose Yourself". It's a definition of new Adam's style. Check it out. "Two-handed tapping. Guitar Workshop" the book + DVD by Adam Fulara will be presented at the MusikMesse - the biggest Europe music market show. Frankfurt (Germany), March 24-27, 2010. Booth 3.1 - A16. Check out new pictures from bass gig in LO12 (Wroclaw). Check out the new pictures of the Fool-X trio at the Cornelis Jazz Festival 2009. Photos: Mariusz "Marchewa" Marchlewicz. Jan 11, 2010 - New server! Check out the pictures from polish premiere of the "Two-handed tapping. Guitar workshop" book+DVD of Adam Fulara in EMPiK - the biggest polish book store. In 2009 we played 18 gigs, over 143 000 visitors have visited www.adam.fulara.com (refreshing excluded). The book "Two-handed tapping - guitar workshop" has been released and that was the most important thing. In the new year 2010 we wish you all the best.